The 2017 Nissan Rogue is available with a 170 hp, 175 lb-ft 2.5-liter engine and CVT transmission, all-wheel drive is optional. The interior is spacious and well-built although performance levels are below average for the class. Featuring a comprehensive standard specification list as well as a range of options such as remote ignition, Bose audio system and adaptive cruise control depending on trim level, the focus here is on comfort and convenience rather than performance. The Nissan Rogue offers a solid alternative in the compact SUV segment, it is spacious and well equipped and offers a comfortable ride. For 2017 a number of changes from an exterior refresh to additional options and trim levels help keep it relevant. The Rogue feels well screwed together and the interior materials are of a high quality. This extends to the knobs, indicator stalks and buttons too. Soft touch materials give the Rogue an upmarket feel. There is ample space for four to five occupants and the seats are comfortable and supportive. The trunk space is good for the class. Rearward visibility is somewhat limited but the standard rearview camera does alleviate this issue somewhat. The Rogue is more relaxed cruiser than sharp handling back road companion but it still exhibits good body control and feels composed over a variety of road surfaces. The CVT transmission and 2.5-liter engine do not make for a combination that allows for or inspires spirited progress and the Rogue’s suspension is not set up for enthusiastic cornering either. Braking and steering are well-weighed and overall the Rogue matches up well to other SUVs in this segment. What you do get is a modicum more off-road ability as the all-wheel drive model comes equipped with a locking center differential and hill-descent control. Refinement levels are good too, as long as the mooing-CVT transmission is not called into action, progress is relaxed in both city and highway driving conditions. 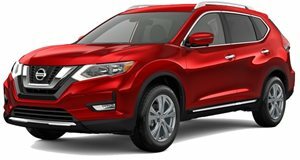 The Nissan Rogue is available with a 2.5-liter engine producing 170 horsepower and 175 lb-ft of torque, a CVT transmission is standard and front-wheel drive is standard with all-wheel drive an option. The gasoline powered 2.5-liter model trails its competitors in the performance stakes, the low torque output combined with the drone-inducing CVT transmission makes for poor overtaking capabilities and other than an eagerness to get off-the line the Rogue feels flat in most driving situations. A 0-60 mph time of around 9-seconds is poor for the class and will have you flailing back and forth in your seat egging the car on as you attempt to merge with fast-flowing highway traffic. 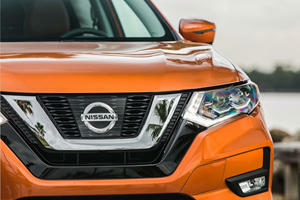 The Nissan Rogue is available in S, SV and SL trim levels. A CVT transmission is standard fitment as is front-wheel drive with all-wheel drive an option throughout. The S trim offers a rearview camera, 5-inch display, cargo management system, LED daytime running lights and a range of safety features such as rear cross traffic alert, blind spot warning and forward emergency braking. An S Appearance Package offers rear privacy glass, roof rails and body-colored heated and power exterior mirrors. The Family Package also adds privacy glass as well as a third row of seats. SV trim includes upgraded 17-inch wheels, dual zone climate control, 6-way power driver seat and intelligent key with remote engine starting. The SV Sun and Sound Package adds a panoramic moonroof and Bose audio system. SV Premium Package features include a navigation system, around view monitor and hands-free liftgate. The Midnight Edition Trim slots in above the SV and focuses on detail exterior trim enhancements. SL trim adds a number of the SV Premium Package features as well as leather upholstery (quilted leather is an option), 7-inch touchscreen and Nissan connect telematics. SL Platinum options add 19-inch wheels, intelligent cruise control, lane departure warning and forward emergency braking. The Nissan Rogue is a competent compact SUV that offers a strong range of features and decent interior space. Safety features are commendable to although you will have to opt for the top-line trim to get the full range of available systems. 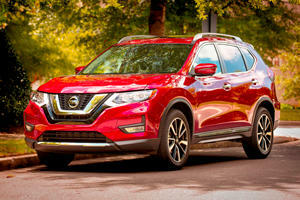 It may not excel in any particular area but other than somewhat disappointing performance figures, the 2018 Nissan Rogue is a smooth and comfortable vehicle with a quality interior. 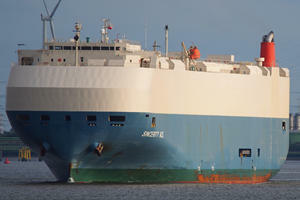 The burning ship is still adrift with its cargo of several thousand Nissans.